Not to be confused with Wells Fargo Building (Portland, Oregon). Wells Fargo Center (center) is slightly taller than the U.S. Bancorp Tower (right). Wells Fargo Center is a 40-story, 166.4 m (546 ft) tower and a five-story adjacent office building with three levels of parking below the surface in Portland, Oregon. The tower became the tallest building in the state of Oregon when it was completed in 1972. The building and a connected five-story building were designed by Charles Luckman and Associates. Originally named the First National Bank Tower, the building opened on April 17, 1972, and was formally dedicated on May 25, 1972. At that time, the bank occupied the first 21 floors of the tower and the entire connected, five-story building, which is known as the Data Processing Building. The name was changed to the First Interstate Tower in 1980–81, after Western Bancorporation, the parent of First National Bank of Oregon, changed its name to First Interstate Bancorp. The current name was adopted after Wells Fargo purchased First Interstate in 1996. Upon opening in 1972, the Wells Fargo Center dwarfed all other buildings in downtown Portland. Public outcry over the tower's scale and the potential of new development to block views of Mount Hood led to height restrictions on all new development. The public areas underwent extensive renovation in 2001, including the addition of more retail space. Renovations were completed in 2002 at a cost of $35 million. Focused on the lobby area, the work included the addition of a display on the bank's history. The center had been the headquarters of Willamette Industries until 2003, when that company was bought by Weyerhaeuser. In November 2017, Starwood Capital Group purchased the tower and adjacent carriage building from Wells Fargo. Wells Fargo Center contains the regional headquarters of Wells Fargo Bank. The tower is located in Downtown Portland, in the block bounded by Southwest Fourth and Fifth Avenues between Southwest Columbia and Jefferson Streets. A skyway connects the tower to the adjacent five-story Data Processing Building, which is also part of the Wells Fargo Center. The 41-story building is the tallest building in Oregon, and the third largest office building with 577,339 square feet (53,636.5 m2). The main bank lobby is home to an authentic 1870 stagecoach from Wells Fargo's past. Architectural details include extensive use of marble. There is a total of 60,000 square feet (5,600 m2) of White Italian marble, 3⁄4-inch-thick (19 mm) thick. The exterior of the building has columns of Bronze-tinted glass, White Italian marble, and anodized aluminum running the entire height of the building. The design of the building has been criticized for a variety of architectural issues. Ivan Doig, writing about Portland for The New York Times in 1976, stated the building was "huge and sleek and featureless". A branch of the Wells Fargo History Museum is located in the building's lobby. The museum's exhibits include an 1854 stagecoach, telegraph and mining equipment, and displays about the company's use of steamboats along the Columbia and Willamette Rivers. ^ "Wells Fargo Center". CTBUH Skyscraper Center. ^ "Building Features and Amenities". Wells Fargo Center. Retrieved 2008-02-06. ^ The Oregonian, April 18, 1972; Section 3 (Business), p. 7. ^ a b Donald Sorensen (May 26, 1972). "Bank dedicates new center". The Oregonian. p. Section 3, p. 11. ^ a b c "Wells Fargo Center". Emporis. Retrieved 2008-02-06. ^ Sorensen, Donald J. (August 19, 1980). "Firm, banks to change name". The Oregonian, p. A10. ^ Jim Tankersley (July 25, 1999). "The tall tale of Portland's two towers". The Oregonian. ^ Gretchen Fehrenbacher (January 30, 2002). "Building owners assn. honors industry standouts". Daily Journal of Commerce. ^ Heidi Stout (July 3, 2003). "Wells Fargo Center nabs KPMG for top floors". Portland Business Journal. Retrieved 21 September 2010. ^ Marum, Anna (November 14, 2017). "Oregon's tallest building just sold to an investment firm". OregonLive.com. Retrieved 15 November 2017. ^ "Building Information and Amenities". Wells Fargo Center. Retrieved 2008-02-06. ^ Dylan Rivera (July 1, 2007). "Downtown is growing up". The Oregonian. ^ Jenkins, Tam (October 1, 2013). "List Leaders: Portland's largest office buildings". Portland Business Journal. Retrieved 7 November 2013. ^ Randy Gragg (August 18, 2002). "Corner Concerns: Portland could be the city of corners, its street life benefiting from its small downtown blocks. But the number of bad corners shows that there's lots". The Oregonian. ^ Doig, Ivan (October 17, 1976). "It's a Great Place to Live, But Would You Want to Visit?". The New York Times. p. 311. ^ "Museums: Portland". Wells Fargo History. Retrieved 24 February 2015. 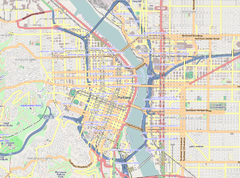 Wikimedia Commons has media related to Wells Fargo Center (Portland, Oregon). This page was last edited on 30 January 2019, at 21:26 (UTC).